FableVision's award-winning work has garnered the best buzz in the industry and beyond. Check out the studio newsmakers and read recent stories. FableVision Studios, in collaboration with Reading Is Fundamental (RIF) and Education Development Center (EDC), is proud to announce the award of a Phase I Small Business Innovation Research (SBIR) grant from the U.S. Department of Education’s Institute of Education Science (IES) program. This award green lights the production of Mix Libris, an Augmented Reality (AR) mobile literacy game that supports and motivates struggling readers. The game innovatively integrates books from RIF’s research-based Read for Success program. The Phase I study will investigate how an AR/gaming approach can combat the summer slide and impact engagement for low-income third and fourth graders, primarily at home and informal education spaces. Want more information? Contact Sarah Ditkoff, Communications Director, at sarah@fablevision.com. FableVision founder and New York Times bestselling author/illustrator Peter H. Reynolds was honored on Monday, April 9, with the 2018 Children’s Literature Award from the Massachusetts Reading Association (MRA). Reynolds joins the ranks of previous children’s literature luminaries, which include Marc Brown, Rosemary Wells, Patricia MacLachlan, Jane Yolen, Tomie DePaola, Laura Vaccaro Seeger, Lois Lowry, Katherine Paterson, and the Pinkney family. The Massachusetts Reading Association is a professional non-profit organization whose primary purpose is to improve the quality and level of literacy in the state of Massachusetts. The MRA is affiliated with the International Literacy Association (ILA), a worldwide literacy organization with a network of 300,000 educators in 99 countries. The MRA promotes literacy for all learners through professional development, research, publications, and advocacy for the literacy community. Reynolds books have been translated into more than 25 languages around the globe and are celebrated worldwide. They include the best-selling Judy Moody and Stink series, The North Star, The Dot, Ish, Sky Color, I Am Peace, Someday, and most recently The Word Collector, which hit the New York Times Best Seller List at position #4. FableVision Studio’s co-founders Paul and Peter H. Reynolds are calling all creatives at their keynote at this spring’s CUE Conference! The CUE conference brings together an array of teachers, administrators, and other professionals dedicated to educational excellence and innovation for four days of dialogue, workshops, and information sharing. On March 16, the Reynolds brothers will deliver their keynote, Calling All Creatives: Time to Make Your Mark! Drawing on their years of experience in the world of educational media and technology, they will argue for the importance of fostering creativity, ingenuity, and bravery in the next generation of problem-solvers: children. The brothers will share some of their personal experiences with creative inspiration, as well as highlight current educational innovators who are succeeding in developing creativity in children. Calling All Creatives: Time to Make Your Mark! FableVision Developer Matt Brelsford Shares How You Can Animate with Code! Join FableVision developer Matthew Brelsford for his upcoming workshop "Animating with Code: Making Things Move for Fun & Profit with Matthew Brelsford” where he will lay out the strategies and techniques used in creating code-driven animations. Bringing 10 years of experience in programming to his presentation, Matt will break down step-by-step how to transform even the most rigid developer art into something flexible, illustrative, and dynamic through code-driven animating. Hosted by Boston Unity Group, join other Unity developers in the Boston area for Matt’s transformative coding presentation and free pizza! Global Tinker's Sep Riahi (left) and FableVision's Leigh Hallisey (right) accept The Paper Girls Show's 2018 Kidscreen Award. Global Tinker and FableVision Studios are thrilled to announce that The Paper Girls Show has been named the Best Web/App Series – Original at the 2018 Kidscreen Awards. The Paper Girls Show joins industry giants such as Sesame Workshop, Amazon Studios, DreamWorks, and 20th Century Fox Television in the 2018 winner's circle. The awards celebrate the market’s premier media and platforms for young audiences. Drawing inspiration from S.T.E.A.M. education and the Maker Movement, the short-form animated series follows the adventures of Caily and Reese, two best friends and makers. Together they discover a secret portal to Confetti, a fantastic world crafted entirely from paper. Confetti allows the girls’ curiosity and creativity to run wild, with mind-blowing (and sometimes hilarious) results. Read the full press release here and subscribe to The Paper Girls Show YouTube channel to watch the first three episodes! FableVision Studios is pleased to announce the opening of its Washington, D.C.-based office to be led by James Collins who, as Director of Strategic Partnerships and Government Relations, will support and accelerate FableVision’s growing roster of public and private collaborations around new technologies, digital storytelling, and pedagogically-progressive learning models. 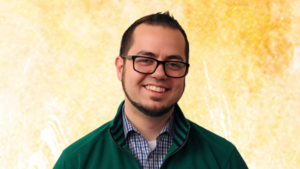 James joins FableVision after their tenure at the U.S. Department of Education’s Office of Educational Technology and the Smithsonian Institution’s Center for Learning and Digital Access where they focused on learning games, as well as education technology policy and research. They have aggressive plans to grow FableVision’s reach in the federal sector. James has a history of bringing together stakeholders to create change including co-founding the first federal Climate Change Game Jam, leading the Equity team for former President Obama’s National Maker Faire, and supporting the Department of Education’s #GoOpen campaign. Read the full announcement on the FableVision blog here. First-time filmmaker Marc Colagiovanni, FableVision Studios, and FableVision founder Peter H. Reynolds’ The Reflection in Me, has been named an official selection at both the 2018 Children’s Film Festival Seattle and the 9th annual Providence Children’s Film Festival. From Marc’s home state of Rhode Island to the seaport city of Seattle, the inspiring film is gearing up for a cross country viewing. The Reflection in Me empowers children of all ages to find the courage to look inside and love themselves as they are. 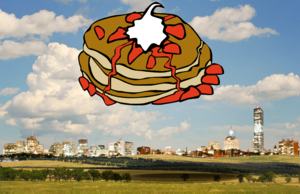 Make way for the The Klumz as we head to California for the 2018 Bay Area International Children’s Film Festival (BAICFF). The festival offers families a cinematic view of the world’s varied cultures and traditions through films that inspire curiosity and conversation. FableVision Studios and Make-A-Wish Metro New York and Western New York worked together to breathe life into the Klumz – the imaginary characters of 10-year-old director Neshama Ryman and her family. The Klumz bring out the beauty and wonder to be found in life’s accidents and messes. Catch them both on the road this winter! 5th Annual ED Games Expo Showcase! On January 8, FableVision will present at the ED Games Expo hosted by the U.S. Department of Education. Bringing together the top players in educational game development and recipients of the prestigious SBIR grant, we are gearing up to showcase three of our finest examples of game-based education at work. This event follows on the Department’s continuing efforts to increase its commitment to exploring the potential of learning games and research into their effectiveness. Together with our sister company FableVision Learning, we invite you to join us for a preview of the games and tools we’re showcasing. Come by to try your hand at playing the games and interacting with the developers at what is always an exciting event for students, educators, agency employees, and kids-at-heart! When: Monday, January 8 from 10 a.m. to 8 p.m. Step Up Your Game Development Skills With Senior Producer Jordan Bach! Together with FableVision Studios, Big, Bold, Beautiful World Media (BBB World Media) launched their first animated original music video, Big Bold Beautiful World, for their Gokul! World property. BBB World Media is a multimedia company that harnesses the power of innovation and creativity to produce stories, experiences, and products that empower the social and emotional development of global generations. Gokul! World is a multimedia property that prepares children ages 4-7 for success by nurturing exploration, understanding, and celebration of cultural diversity. Gokul! World features the globe-traveling adventures of six culturally diverse friends who go on adventures, solve problems with their individual talents, celebrate holidays, explore traditions, and embrace this big, bold, beautiful world. BBB World Media worked with FableVision’s Vice President of Creative, Tone Thyne, to produce a beautifully crafted animated film that captures the heart of Gokul! World’s messaging. The property will expand to include digital shorts, an animated series, interactive mobile games, additional books, and merchandise. BBB World Media founders Bal G. Das and Jeni Lee Chapman assembled a team of experts from every vertical – publishing, digital games, TV, and consumer products – to build a children's brand that would resonate globally and thrive in today's content-focused environment through a time-to-market advantage. The joy of teamwork, friendship, and curiosity about the world are at the heart of every Gokul! story. Read the full press release here to learn more about this new initiative and check out Jeni’s Linkedin Pulse piece. For more information about Gokul! World visit www.gokulworld.com. Come join the adventure! 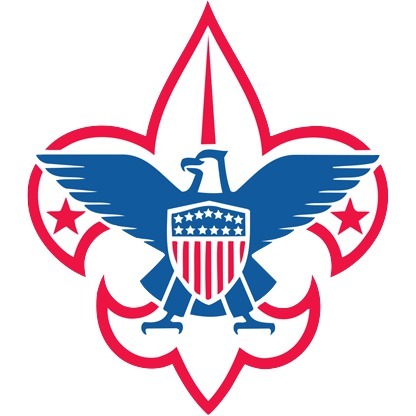 FableVision will proudly cheer our creative champion as The Boy Scout of America Spirit of Adventure Council presents the award to Peter at the 41st annual “Salute to Scouting” gala at The Westin Copley Place. WCVB TV Anchor Randy Price, himself an Eagle Scout, will serve as master of ceremonies. This signature Boston event attracts hundreds of scouting supporters, including business and civic leaders who aim to expand Boy Scout youth development programs throughout the Greater Boston area. When: Thursday, November 30th at 6 p.m.
FableVision’s Peter Stidwill will join Georgia Public Broadcasting’s Andrew MacCartney and Laura Evans to speak at the 2018 SXSW EDU conference. Selected from the competitive, crowd-sourced PanelPicker platform, the case study Immersive Learning: Teaching History through GBL will cover how media developers, public broadcasters, and educators worked together to create the award-winning game, Georgia Race Through Time. Georgia Race Through Time draws from primary source documents and rich historical content to create an immersive educational experience aligned to Georgia’s 8th grade social studies standards. This case study will share FableVision and GPB’s experiences in reaching the hard-to-engage adolescent audience, merging primary documents with modern technology to create a unique game experience, and leveraging collaboration across disciplines for a game-based learning approach. SXSW EDU empowers its global community to connect, discover, and impact. SXSW EDU is a component of the South by Southwest family of conferences and festivals. 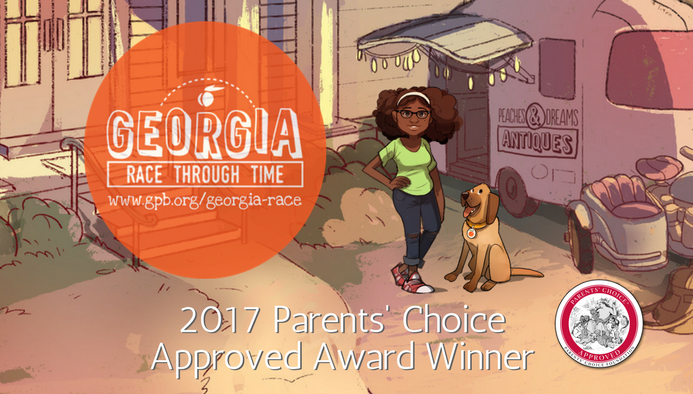 Georgia Public Broadcasting (GPB) and FableVision Studios are proud to announce that Georgia Race Through Time was selected as a 2017 Parents’ Choice Approved Award Winner by the Parents’ Choice Foundation. The Parents' Choice Awards is the nation's oldest nonprofit program created to recognize quality children's media. The award is designed to help parents and caregivers make informed decisions about which new products are right for their children. The Award program honors quality media in the audio, books, DVD, magazines, computer software, television, toys, and video games categories. Georgia Race Through Time’s unique storyline features Savannah, a young antiques expert, and her trusted canine companion, Peaches. Together, they travel all over Georgia, from Athens to Vidalia, as they in a race to collect historical artifacts. The new history game is aligned to Georgia Standards of Excellence (GSE) for 8th grade social studies. When all of the challenges have been completed successfully and the artifacts are retrieved, Savannah and Peaches save the day and win fame and fortune. Check out GPB's site for more information and learning resources and read their blog post for more details about the award. Big, Bold, Beautiful World Media (BBB World Media), a multimedia company that harnesses the power of innovation and creativity to produce stories, experiences, and products that empower the social and emotional development of global generations, introduced its first children's media property, Gokul! World, today. Gokul! World is a multimedia property that prepares children ages 4-7 for success by nurturing exploration, understanding, and celebration of cultural diversity. Gokul! World features the globe-traveling adventures of six culturally diverse friends who go on adventures, solve problems with their individual talents, celebrate holidays, explore traditions, and embrace this big, bold, beautiful world. The property launches today as an illustrated storybook and will expand to include digital shorts, an animated series, interactive mobile games, additional books, and merchandise. BBB World Media founders Bal G. Das and Jeni Chapman assembled a team of experts from every vertical – publishing, digital games, TV, and consumer products – to build a children's brand that would resonate globally and thrive in today's content-focused environment through a time-to-market advantage. Gokul Village and The Magic Fountain is co-authored by company founders Bal G. Das and Jeni Chapman and illustrated by celebrated children's book illustrator Charlene Chua. Gokul Village and the Magic Fountain is available on Amazon and Barnes and Noble beginning October 5. FableVision is currently working with BBB World Media on Gokul! World to bolster children's social-emotional development through fun, relatable, and interactive adventures that celebrate cultures around the world. Stay tuned for the release of the company's first animated short and original song, "Big Bold Beautiful World," produced with FableVision Studios, set for debut shortly. Read the full press release here to learn more about this new initiative. For more information about Gokul! World visit www.gokulworld.com. With festival season underway, The Klumz and The Reflection in Me have both been selected to screen at several upcoming film festivals. FableVision Studios and Make-A-Wish Metro New York and Western New York worked together to breathe life into the Klumz – the imaginary characters of 10-year-old director Neshama Ryman and her family. The Klumz bring out the beauty and wonder to be found in life’s accidents and messes. The film will screen at the Milwaukee Film Festival. The Reflection in Me empowers children of all ages to find the courage to look inside and love themselves as they are. Together, first-time filmmaker Marc Colagiovanni, FableVision Studios, and FableVision founder Peter H. Reynolds created The Reflection in Me to follow the impactful experience of a child going through the practice of self-love and acceptance. The short film is an official selection of the Mill Valley Film Festival, the Boston Kids International Film Festival, and the Great Lakes International Film Festival. 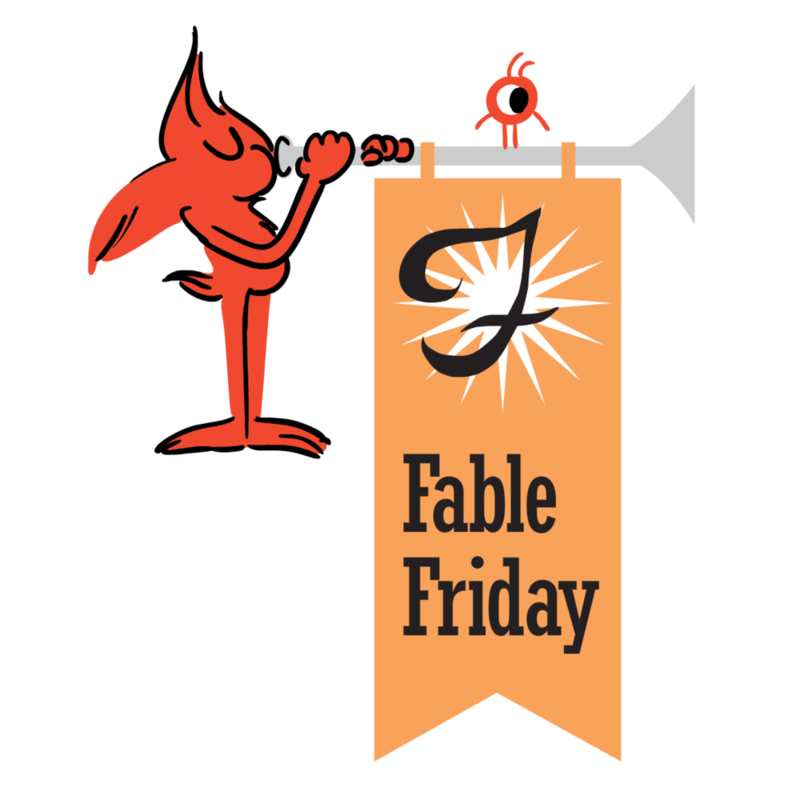 Join FableVision’s Shelby Marshall and Kevin J. Gray, Director of Westchester K-12 Publishing Services, for a roundtable discussion on exploring how to use the strengths of both print and digital media to deliver content that enhances student learning! Register for the conference here. What: Print has been declared dead repeatedly over the past two decades, while digital has been consistently crowned the new king. However, despite declarations of its death, print continues to be a viable delivery medium—so much so that today, print and digital still share the throne. Why? Because the long-standing debate over print vs. digital misses the point. What educators and publishers have discovered is that how content is delivered is simply not the core consideration. The key question is how to provide effective learner-centered instruction that engages all learners. This approach frees us to design a mix of tools and experiences that enable learners to meet learning objectives, delivered through whichever platforms and media are most appropriate for the context. The Klumz is making its way to Japan this fall as a 2017 finalist for the Japan Prize in the Audiovisual Division. A film about little creatures who find beauty in everyday messes, The Klumz follows the story of wish kid Neshama Ryman’s favorite imaginary characters. FableVision Studios produced the animated film in partnership with Make-A-Wish Metro New York and Western New York. A highly regarded distinction in the educational media industry, the Japan Prize is an international competition established by NHK (Nippon Hoso Kyokai, Japan Broadcasting Corporation) in 1965 to recognize excellence in educational television. 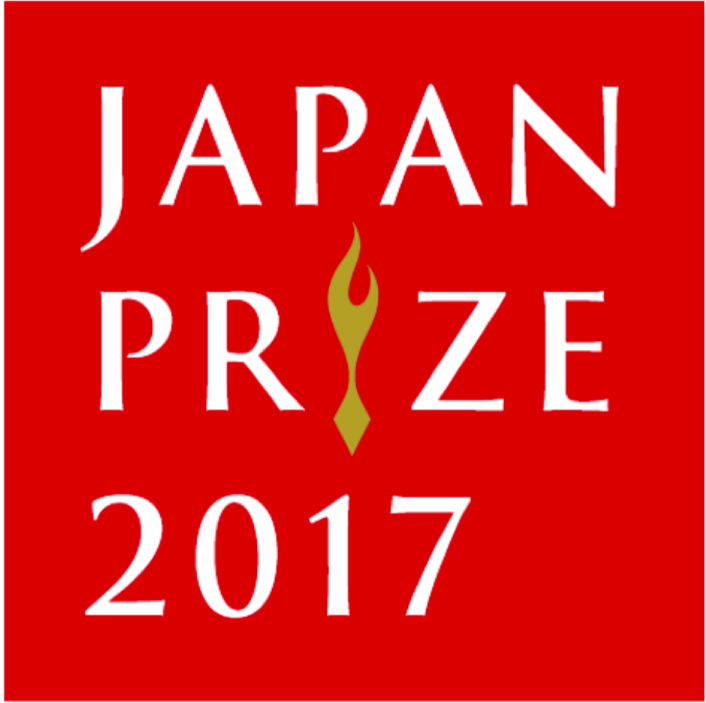 As of 2008, the Japan Prize honors educational videos, movies, websites, games, and other interactive audiovisual products along with television content. Past winners include the FableVision-produced game Quandary, from Learning Games Network. Learn more about The Klumz here. Rock the vote to get us to SXSWedu 2018! Using game-based learning, Georgia Public Broadcasting (GPB) and FableVision Studios are ramping up student engagement! We're hoping to bring our team of playful experts to SXSWedu 2018 in our session “Immersive Learning: Teaching History Through GBL.” In this production case study, our panelists will share how media developers, public broadcasters, and educators came together to pioneer Georgia Race Through Time, a new supplemental 8th-grade history game. Leverage collaboration across disciplines to produce a game-based learning approach to improving students' learning performance. Head to the SXSWedu PanelPicker website. Make an account to view our session. Share with your network via Twitter, Facebook, and Instagram with the tags #SXSWedu and #PanelPicker. FableVision Studios and Marc Colagiovanni are proud to share that The Reflection in Me has been selected to screen at both the 5th Annual Skyline Indie Film Fest and the Auburn International Film Festival for Children and Young Adults (AIFF). The Reflection in Me is a short film written by first-time filmmaker, Marc Colagiovanni, an attorney based in Rhode Island. Together with FableVision Studios and FableVision founder Peter H. Reynolds, The Reflection in Me aims to empower children of all ages to find the courage to look inside and love themselves as they are. The premiere place for indie filmmakers, Skyline Indie Film Fest is an independent film festival that fosters filmmakers by bringing the absolute best in independent, undistributed films from around the world. Learn more about the festival here. Auburn International Film Festival for Children and Young Adults is the leading screen event dedicated to children and young adults in Australia. The AIFF festival will be held at Reading Cinemas in Auburn as well as Primary and High Schools from around the Western Sydney region. Learn more about the festival here. We’re thrilled to announce that The Klumz will be featured at the 13th annual HollyShorts Film Festival in Hollywood, California! FableVision Studios and Make-A-Wish Metro New York and Western New York teamed up with 10-year-old Neshama Ryman to bring her favorite imaginary characters, the Klumz, to life. HollyShorts Film Festival is an organization devoted to showcasing the best and brightest short films from around the globe. Taking place in August, the HollyShorts Film Festival showcases the top short films produced 40- minutes or less and was recently named an Academy Awards Qualifying Festival. Join Gary Goldberger and Peter Stidwill at the 2017 Serious Play Conference for a talk about the power of intergenerational co-play and how it’s being used in museums and informal learning spaces. Gary and Peter will show work the studio has done for museums of all shapes and sizes, from the New England Aquarium to the Smithsonian Institution. Learn tips to create unique, personalized play spaces the whole family will enjoy. When: Wednesday, July 19, 2017 at 1:15 p.m.
Register to attend the 2017 Serious Play Conference here. And why games are a great answer for some learning situations, but not for others. Featuring expert insights from educational game developers, the webinar will provide attendees with valuable strategies for improving existing game content and creating new materials. Whether you already consider yourself adept at the gaming market or are thinking about making your first foray, you will come away with how-to advice you can put into action now. Empowering Empathy Through Gaming at ISTE 2017! See you in San Antonio! Committee for Children’s Rachel Kamb and FableVision’s Gary Goldberger and Leigh Hallisey will share insights on merging content with gaming to develop social-emotional competencies and reduce bullying. What: Kids spend a lot of time developing social-emotional skills in person, and digital experiences can support this growth by promoting empathetic, ethical decision-making. Leveraging research, psychology and media, the Committee for Children and FableVision share insights on merging content with gaming to develop social-emotional competencies and reduce bullying. FableVision Studios is thrilled to announce that The Klumz has been named a Bronze Award winner for the 38th Annual Telly Awards in the Animation category. With over 12,000 entries from all 50 states and five continents, the Telly Awards is the premier award honoring outstanding local, regional, and cable TV commercials and programs, the finest video and film productions, and web commercials, videos, and films. The Klumz is a touching film about little creatures that make messes around the house. They constantly spill milk, knock over plants, and leave food crumbs around—not to cause trouble, but because the Klumz see messes as beautiful. FableVision Studios and Make-A-Wish Metro New York and Western New York teamed up with 10-year-old Neshama Ryman to bring her favorite imaginary characters, the Klumz, to life. Click here to see all of this year’s winners. You are perfectly perfect just the way you are! FableVision and Marc Colagiovanni have a positive message to share with the world with the special Father's Day launch of the new animated film The Reflection in Me. The film’s goal is to empower children of all ages to find the courage to look inside and love themselves as they are. "It's a universal message, " shared Peter H. Reynolds, FableVision founder and New York Times bestselling author of The Dot and Happy Dreamer. "When Marc shared his story with me, I knew we had to share it with the world. I suggested to Marc that his story would make a wonderful animated film." Produced by FableVision, the film was written by Marc Colagiovanni, Rhode Island attorney and new filmmaker. Reynolds acted as illustrator and executive producer. The Reflection in Me follows the impactful experience of a child going through the practice of self-love and acceptance. "It started really as a message to my own children," said Colagiovanni. "As a father to three little girls, I know they will be facing a challenging journey where the world puts more emphasis on how you look and not what's inside. I wrote the story for them, but I knew in my heart it was a message for all kids." "Our mission at FableVision for the past 20 years has always been to tell ‘stories that matter, stories that move.’ This film shares a moving message that will resonate not only with children, but kids of all ages," Reynolds adds. Colagiovanni lives in Cranston, RI with his wife, Lauren, and their three daughters Addison (6), Ella (4), and Mia (4). He has been an attorney for 16 years in Warwick, RI. He is already at work on his next project. The film is available to be considered for screening at 2017-2018 film festivals. You can view the film for free at www.fablevisionstudios.com/reflection. The Silliest Counting Show Ever! FableVision Studios is putting the silly in math and counting education with the launch of The Silliest Counting Show Ever! for Sesame Studios, the premiere YouTube destination for kids from the makers of Sesame Street. The channel offers free original stories and songs, complete with new Sesame friends, good humor, and the classic educational goodness synonymous with the Sesame Street brand. Conceived and written by Tone Thyne, FableVision collaborated with Big Breakfast to produce the live action video starring one-year-old Otis and four-year-old Victoria for a humorous, educational vignette on counting. FableVision supplemented the video with animation and motion graphics. The video teaches counting and sequencing, and folds in lessons of patience, tolerance, and creative problem solving. Watch the video and be sure to subscribe to Sesame Studios for brand new videos to make you smarter, stronger, and kinder! 2017 Content in Context Conference! FableVision Studios and Smithsonian Science Education Center are proud to announce that Good Thinking! : The Science of Teaching Science is a finalist for a 2017 REVERE Award in the Best Learning Resources category from the Association of American Publishers (AAP). The animated professional development series Good Thinking! is designed to support K-12 science educators through targeted short-format videos that explore common student ideas and misconceptions about a range of science topics such as energy, chemical reactions, and natural selection, as well as pedagogical subjects like student motivation and the myth of left and right-brained people. The series is available for free on YouTube here. AAP REVERE Award winners and finalists will be recognized at the award ceremony on May 25 at the 2017 Content in Context (CIC) Conference. Join FableVision’s Shelby Marshall at the CIC Conference where he will attend the awards ceremony. As a member of CIC’s 2017 planning committee, Shelby will also lead sessions in planning, producing, and navigating the development of educational technology. When: Wednesday, May 24 at 9:30-10 a.m.
No matter how great an instructional technology product is, it will have no impact on student learning if it doesn’t get purchased and implemented. Together with Capstone’s Chief Marketing Officer, Matt Keller, Shelby Marshall will demonstrate why it’s important to take the needs of students, educators, and administrators into account when developing a product. When: Wednesday, May 24 at 1:45-3 p.m.
Take a deep dive into the technologies that are driving the evolution of educational resources. Shelby Marshall will lead one discussion and one activity session on group generation of use cases where panelists and attendees will generate 4-6 use-case scenarios related to student-centered education. When: Friday, May 26 at 9-9:45 a.m.
Educational gaming has become a necessary and beneficial part of learning environments. However, before they can be implemented, it’s important to understand exactly how educational games fit. Shelby Marshall will moderate this panel on how and why to incorporate gaming into your company’s future plans. Phase II SBIR Grant for Cyberchase Fractions Quest! FableVision Studios is proud to announce that we have been awarded the EDC/IES SBIR Phase II grant through the U.S. Department of Education’s Small Business Innovation Research (SBIR) program. The grant will allow for full development of the Cyberchase Fractions Quest game. The SBIR program, operated out of the Institute of Education Sciences, has funded projects to develop education technology designed to support students, teachers, and administrators. The Cyberchase Fractions Quest game is created in collaboration with WNET's award-winning producers of the PBS KIDS math series Cyberchase and the Education Development Center’s Center for Children and Technology (EDC/CCT). The immersive, story-based mobile and desktop game engages 3rd and 4th grade students in fractions learning and will be developed for both schools and homes, complete with educator and parent resources. Learn more by heading over to the Institute of Education Sciences blog to find out more about our project—and congratulations to this year’s extraordinary roster of awardees! In this session hosted by Serious Play Conference, attendees will hear from FableVision’s Peter Stidwill and Gary Goldberger about work the studio has done for museums of all shapes and sizes: from the New England Aquarium to the Smithsonian Institution. Learn tips to create unique, personalized play spaces the whole family will enjoy. Join FableVision CEO Paul Reynolds where he will be sharing how teachers have shaped both him and his brother, Peter H. Reynolds, to not only develop the courage to navigate their own unique creative work, but led them to make it their own life’s mission to encourage others to do the same with a host of digital tools they have developed that support creativity and self-expression, as well as STEAM/maker education. Hosted by Young Audiences Arts for Learning, Digital Transformation is a national arts-in-education conference that addresses the innovative ways that technology and the arts can make students active participants in their own learning and bring schools, families, and communities closer together. When: Thursday, April 20, 4 p.m.-5 p.m.
Join FableVision’s Gary Goldberger and Peter Stidwill and Georgia Public Broadcasting’s Laura Evans to discuss Georgia Race Through Time, a new history game. Aligned to Georgia standards for 8th grade social studies, the game leverages primary source documents and rich historical content for an engaging, story-based, educational experience. Hear from the GPB and FableVision teams in this production case study for how to utilize story-enriched, standards-based media to teach historical content. Session attendees will gain strategic insights on how collaborating with the right partners results in quality media for modern learners. PBS TechCon is the key educational event for anyone in public media who works in technology. Presentations from stations, vendors, national public media organizations, academics, and thought leaders from across the non-commercial and commercial sectors make PBS TechCon a varied and powerful event for learning, brainstorming, and collaboration. FableVision Studios is proud to announce that The Klumz will be heading to Toronto for its world premiere on the big screen at the 2017 TIFF Kids International Film Festival. The Klumz is a touching film about little creatures that make messes around the house. They constantly spill milk, knock over plants, and leave food crumbs around – not to cause trouble, but because the Klumz see messes as beautiful. FableVision teamed up with 10-year-old Neshama Ryman to bring her favorite imaginary characters, the Klumz, to life. In the Ryman household, accidents, messes, and unforeseen instances of chaos are always attributed to fictional creatures created by Neshama called the Klumz. FableVision conceptualized and developed a storyboarded script based on Neshama’s ideas and sketches. Neshama took the role of director, approving designs, directing some of the dialogue in the recording session, and illustrated the background for the animation. The Klumz joins a lineup of films that shine a spotlight on thought-provoking stories that explore diverse themes of home, family, identity, and immigration. The festival will be presenting films that promise to educate, inspire, and entertain children and adults alike. Marking its 20th anniversary this year, the TIFF Kids International Film Festival is the premiere festival in North America for children ages 3-13. Running April 7- 23, the festival is larger than ever with over 160 films, consisting of 33 feature films and over 125 shorts hailing from over 40 countries including Canada, Algeria, Germany, Hong Kong, Ivory Coast, Brazil, Mexico, and many more. Click here to get your tickets and here to learn more about the film. GPB Partners with FableVision Studios to Launch "Georgia Race Through Time"
Georgia Public Broadcasting is bringing history to life with Georgia Race Through Time (GRTT), a new history adventure game produced in partnership with the award-winning media developers at FableVision Studios. Aligned to Georgia Standards of Excellence (GSE) for 8th grade social studies, Georgia Race Through Time’s unique storyline features Savannah, a young antiques expert, and her trusted canine companion Peaches. Together, they seek to find historical artifacts hidden in cities all over Georgia from Athens to Vidalia. The game begins with Savannah and Peaches receiving a mysterious email inviting them to participate in a race to collect historical artifacts. Students help them compete by following along in the challenges and answering Georgia history questions. When all of the artifacts have been retrieved with the help of students completing the challenges successfully, Savannah and Peaches save the day and win fame and fortune. Georgia educators and students were included in the development process, creating an engaging, game-based learning experience. Georgia Race Through Time is designed to work across web and mobile platforms and is available online and via mobile devices. The Future of Education Technology Conference (FETC) is one of the largest, national, independent education technology conferences, and annually attracts thousands of education and technology leaders from around the world. FableVision Learning has two sessions. Save the date and be sure to attend to learn more about STEM and creative maker tools! When: Thursday, Jan. 26, 2017, at 2:30-3:30 p.m.
Fab@School Maker Studio's Lead Software Designer Dr. Peggy Healy Stearns will join Library Media Specialist Hollyanne Ruffner from Palm Beach County Schools to share how Palm Beach County has created compelling and practical maker spaces in school libraries and classrooms with Fab@School Maker Studio, inexpensive digital cutters, and paper and cardstock. When: Friday, Jan. 27, 2017, at 10-11 a.m.
Join FableVision Learning's Paul Reynolds, Dr. Peggy Healy Stearns, and Dr. Denine Jimmerson for their session Create Bravely: Empowering STEM Education Through Creative Maker Solutions. The team will share how teachers and students can enjoy STEM learning with cost-effective, cross-curricular projects using digital fabrication, digital publishing, and animation. Catch FableVision’s Shelby Marshall and Sarah Ditkoff’s Agile Ed Marketing Webinar! Video is fast becoming the most powerful and effective marketing tool for online businesses. Join FableVision’s Shelby Marshall, Vice President of Strategic Partnerships and Product Solutions, and Sarah Ditkoff, Marketing and Client Services Manager, in an exclusive webinar on harnessing the power of animated videos to create effective marketing campaigns. They’ll share tips and insights on how to leverage videos to captivate an audience with “stories that matter, stories that move.” This webinar will provide an overview of animated videos and prepare you to use them in your marketing initiatives. Kick off the New Year with a powerful new tool in your marketing toolkit! Georgia Public Broadcasting Education: GPB Education, the Georgia Council on Economic Education, and FableVision Studios Launch Lights, Camera, Budget! Dig-It! Games: Q&A With Paul Reynolds, CEO Of FableVision, Inc.